As an Industrial Supply Company, What Do I Need to Add to My Hazcom Inventory? Complete Question: I am developing an updated hazardous material inventory for my Hazard Communication (HazCom) program. We are a industrial supply/hardware supply company that maintains an inventory of paints, thinners, lubricants, and cleaners etc. The employees do not use these substances, but do handle them from receiving, to the shelf, to the customer. What should be added to the inventory and what Safety Data Sheets (SDSs) need to be maintained – everything with a precautionary statement, or only products that employees use to clean the restrooms etc? Answer: Based on the description provided, this work operation may only be subject to limited coverage of the Hazard Communication requirements per 29 CFR 1910.1200(b)(4), and may not require a written hazard communication plan or list of chemicals. 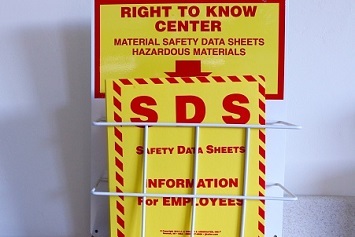 Ensure that employees are provided with information and training as listed in 29 CFR 1910.1200(h)(except for the location and availability of the written hazard communication program), to the extent necessary to protect them in the event of a spill or leak of a hazardous chemical from a sealed container. However, as a distributor of hazardous chemicals, you still have a responsibility to provide SDSs to downstream customers at the time of the first shipment and when the SDS is updated. As for products used to clean the restrooms, if these are consumer products that are used in the workplace for their intended purpose and in the same manner (i.e., the same duration and frequency) as they would be used by a consumer, they are not subject to hazard communication requirements [29 CFR 1910.1200(b)(6)(ix)].